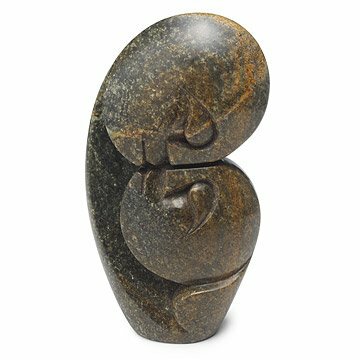 Hand-carved by Shona artisans in Zimbabwe, this beautiful stone sculpture symbolizes love. Embrace tradition with this tender soapstone sculpture hand-carved by Shona artisans in Zimbabwe. Shaped from a single stone, this symbolic serpetine sculpture illustrates the unbreakable bonds of love. Using a technique passed down by their ancestors, modern-day Shona artisans hand-pick and quarry their stones and carve them using simple tools and polish the finished product with sand and beeswax. The final touch: Each sculpture is heated over a fire to bring out the natural luminescence of the stone. Handmade in Zimbabwe. Each is one-of-a-kind and will vary. 7" H x 4" W, 2 lbs. Arrived early and in plenty of time for Valentine's day. My wife has it on her nightstand. This was a Great gift for my friend. She is an outdoor lover. The happy couple loved their gift and have it setting on their mantel. She continues to rave about it! This sculpture is a perfect gift for anyone who is in love. I would buy everything from uncommon goods. I use it as a bookend and art piece. One of a kind gift; Uncommon; Unique. My wife loved it.